We are simply captivated by Channel Ten’s Junior MasterChef series in our house. My children are blown away by the talent and skills these kids have that seems way beyond their years. Or perhaps it’s time to embrace the notion that – like riding a bike, skiing, reading and writing – cooking is a skill that can be learnt from a very young age. These scrumptious aprons from Smidgebox are a perfect starting point to kit your kids out in the kitchen. Smidgebox Wee Chef Sets include a reversible print apron with button neck and waist enclosures and a quilted square pot holder. There’s also a pocket for keeping cookie cutters and other implements close to hand. 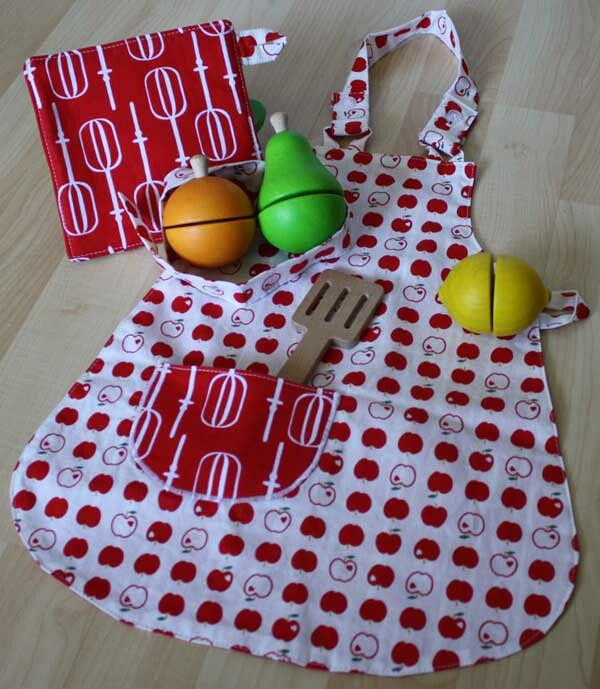 The apron’s red apple and beaters prints are perfect for both girls and boys and matching oven mitts are available on request. The Smidgebox Wee Chef Set is available in three sizes to fit toddlers, preschoolers and school-aged children up to about seven years. Once your mini chefs are looking the part and ready to gain some culinary skill, check out these Junior MasterChef kits to get them excited about cooking and perhaps contenders for the next series of Junior MasterChef! Sets cost from US$34 from Smidgebox, with delivery to Australia available.